The same train as it passed my perfect location. No, they don’t all look the same these days as some suggest. Each is interesting and different in it’s own way. This one is moving empties, as suggested by the horsepower on the front end and its direction of travel, over the top into Golden where they will find their way into the coalfields to the south. All of them were accompanied by a pusher. Some were heavy enough, even empty, to need mid train help. I counted 5 or 6 of these coal trains just during daylight hours. There may have been more but when I was sitting next to the pool with my Caesar and a book it was hard to identify the consists by the sounds beating through the trees below. It’s also interesting that despite the rolling and broken landscape it is easy to see the grade these machines are fighting against. The roar from the engines suggests they are being worked as had as the manufactures had intended. There were no slackers here. A modern fleet of high-powered locomotives dominate the show in Albert Canyon. During my two day stay I never saw so much as one old SD40-2 in action. 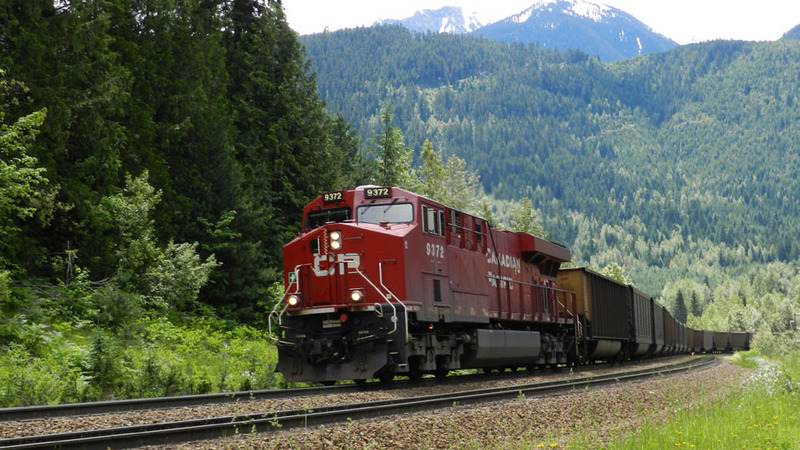 The single locomotive that was the face of CP Rail in the west for so many years. Now there were AC4400s only out numbered by ES44AC and DC units leading and in helper service. Mid train and otherwise.